Besides its toasty crunch and restrained sweetness, a hint of orange blossom water and plenty of nuts make Noor Al Mousa’s baklava possibly the best we’ve tried. Al Mousa, a Syrian baker who’s part of the Syrian Sweets Exchange organization, sells an array of baklava at the Scottsdale, Arizona farmers’ market. To “glue” the walnuts to each other and to the filo, Al Mousa mixes the nuts with sugar and a little syrup, then presses as she builds the pastry. Start the day before to make assembly easy: Thaw the filo, simmer up the syrup and let it cool, and make clarified butter if you like. Make syrup: In a medium saucepan over medium heat, bring granulated sugar and 1 cup water to a boil, stirring occasionally. Add lemon juice. “It helps prevent crystallization,” Al Mousa explains. Reduce heat to an active simmer and cook, stirring occasionally, until slightly thickened and reduced to a scant 1 3/4 cups, 10 to 12 minutes. Remove from heat, stir in 1 tsp. orange blossom water, and let syrup cool. Preheat oven to 350°. Make filling: In a large bowl, combine superfine sugar, remaining 2 tsp. orange blossom water, and 1/3 cup syrup. Add walnuts and stir until well blended. Set remaining syrup aside. Brush a rimmed baking sheet with a bit of the butter. Unroll filo. As you work, “keep it covered with a kitchen towel if you feel it’s drying,” Al Mousa advises. Lay 1 sheet filo in pan and brush generously with butter, making sure to cover all the dough. Repeat until you’ve used 14 sheets (any air bubbles that form will work their way out). Spoon filling over filo, spread evenly, and press mixture all over with back of spoon. “This way it won’t fall apart when you eat it.” Lay a sheet of filo on top and press it firmly with flat hands. 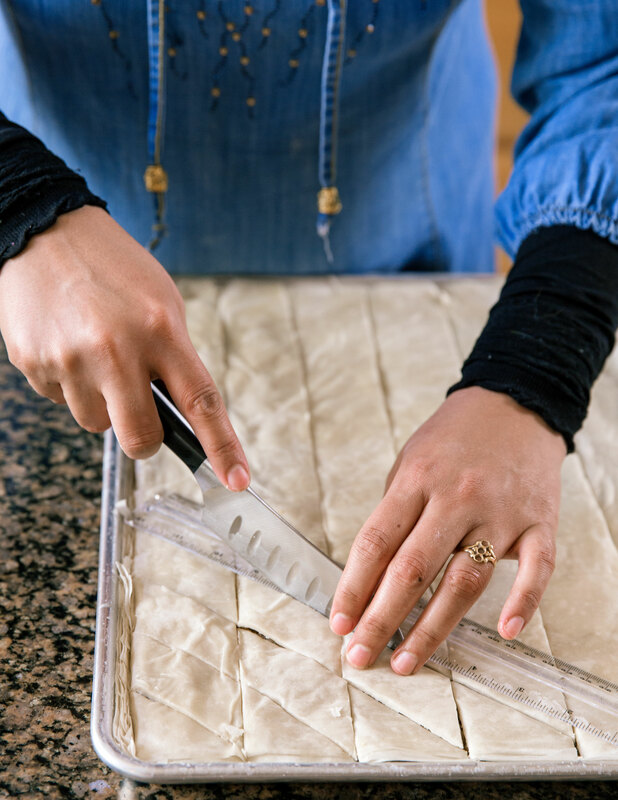 Brush generously with butter, then repeat layering, pressing, and buttering with 5 more sheets. Layer and butter remaining 6 sheets, flattening them with your hands (no need to press). With a knife, trim shaggy filo edges flush with sides of pan (leave edges in pan for snacking later!). Using knife and a ruler, score filo at opposite long ends to mark 6 equal strips; then cut along score lines, using the ruler as a guide. Repeat on a diagonal, making 12 strips 1 1/2 in. wide to create diamonds. Sprinkle center of each diamond with a generous pinch of pistachios. Let baklava cool in pan on a rack at least 1 hour. Re-cut if needed before serving, and cut bigger pieces in half if you like. *Find orange blossom water at grocery stores with baking and cocktail supplies, and at international markets. Find ghee at supermarkets and Indian grocery stores, and samneh at Arabic markets; a blend of butter and oil is the most economical, but all-butter tastes the best. At grocery stores, check packages of frozen, paper-thin filo dough carefully for size (you want sheets about 12 by 17 in. ), and buy more than 1 box, as the quantity of sheets per pound varies by brand. To help prevent cracking, thaw in the refrigerator overnight, not on the counter. MAKE AHEAD: The syrup and the baklava, up to 1 week, airtight at room temperature.